The local feed and grain store is a place the Pres and I visit monthly. Our last trip proved to be just a tad expensive as we need to pick up two bags of dog food (at $38.99 a bag) and I wanted to look at new collars for the "kids." With Moon's fur being longer and so thick, a flat collar seems to cause tangling so I had my sights set on round leather collars for both of them. I mean you can't very well treat one kid and not the other, right? The Pres placed one 35 lb bag of their dry food on the counter and returned to get a second since we go through one a month and would need it anyway. Meanwhile I meandered down the isle looking for collars. Standing in front of the display of the neatly placed soft round rolled leather collars, two grabbed my attention immediately. They had bright red tags with the word CLEARANCE on them. The regular price on the lengths I needed were $21.99 and $19.99 while the prices on the luggage tan 22" and the red 20" were $11.99 and $9.99 respectively. I didn't care if the Pres would have to trim the excess leather. In my book, the price was right! Immediately placing them over my wrist I headed to the register to meet the Pres who had just returned with he second bag of dry kibble. As the girl rang up our order, she stopped mid-stream questioning the price on the collars, calling her supervisor over. Standing silently in front of them as they "discussed" the quandary, the supervisor announced, "someone will be spoken to if I have anything to say about it! If you need an override, let me know since they may be going out the door under cost." She then walked away in a huff. Although I'm sure she said that to make us feel like they were loosing money on their mis-priced merchandise, no over-ride was needed. The kids loved their new look. Just look at those adoring eyes. precious photos, and what a deal on the collars..
Oh really a huff over two mismarked collars! That manager needs to get a life! They look very nice!! Well, that lady, sure doesn't know what it means when the customer is always right!!! she is the one that needs to be questioned. When a price is on something, that is the price.! 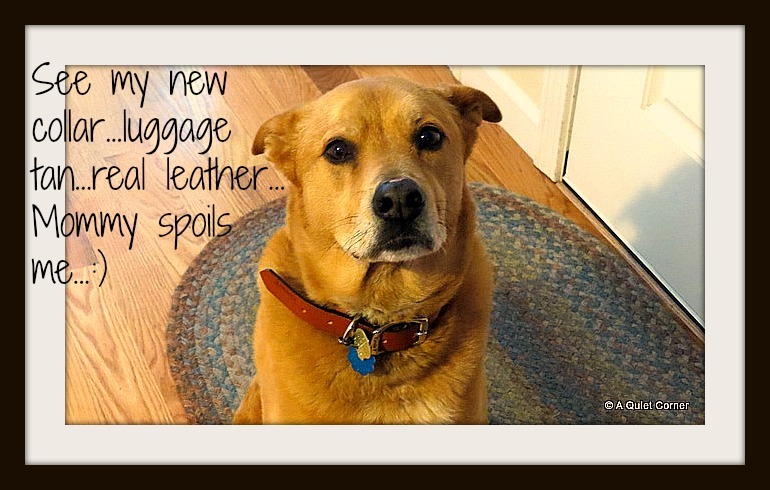 I only use leather collars on my dogs. You got a good buy... the food is around the same a we pay here. Our dogs are loyal friends..and we must treat them the same..
That was rather rude on the manager's part I would say. I've had people bring me things at work that are obviously mismarked and I always tell them yes it is incorrect but our loss is your gain. Of course then I always high tail it to the shelf to make sure there are no others marked that way. Hmmmm...she needs a lesson in customer service! They look stunning and proud of their new accessories. And I'm sorry to say the supervisor needs to learn better customer service! Glad you got them at a great deal! So sweet pictures and text "Real leather - Mommy spoils me " :-) exactly how it is supposed to be!